They are provided to show you how Draw 'T Lisp converts drawings into Autolisp programming code and parametrically links the entities together! 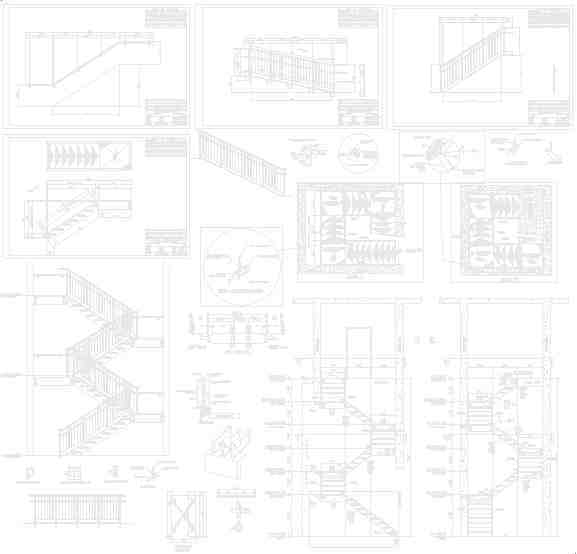 This is the "Introduction of the Stair Project". This starts out mapping the"Bottom Noseline & Stringer". This adds the "Bottom Closure, Base-Clip, Start-Pan, Pan & array". This adds the "Bottom Landing (near-side)". This adds the "Bottom Inside Stringer (far-side)". This starts the "Top Noseline & Stringer". This adds the "Top Closure, Base-Clip, Start-Pan, Pan & array". This adds the "Top Landing". This adds the "Top Inside Stringer". This adds the "Elevation Annotations". This "Drawing the whole Elevation" using the code produced up to this point. This is a Drawing of a "awaiting more video's".